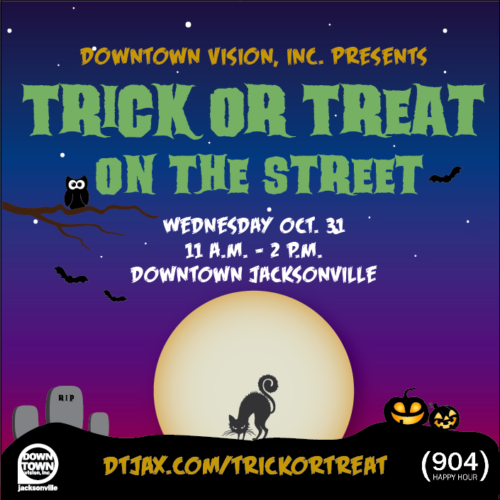 First Coast residents are invited to the 6th Annual Trick or Treat on the Street in Downtown Jacksonville on Wednesday, Oct. 31, 2018, from 11 a.m. to 2 p.m. There is no cost to attend this event. More than 20 businesses will hand out candy, coupons and promotional goodies during the 6th Annual Trick or Treat on the Street, presented by Downtown Vision, Inc.
On Wednesday, Oct. 31, Downtown employees, families and children of all ages are invited to visit participating shops and restaurants to trick or treat from 11 a.m. to 2 p.m., with some locations open until 3 p.m. Costumes are encouraged. Visit DTJax.com/trickortreat to download the event map or visit a participating location to pick one up.